The 9th edition of the Allianz Junior Football Camp (AJFC) is here, led by former Bayern Munich star Giovane Elber, offering talented teenagers a 'once-in-a-lifetime' opportunity to train at the facilities of the German champions in Munich, Germany. The AJFC program was started in 2009 by German insurance company Allianz in partnership with the Die Roten as part of their dedication to youth development. Leading the program in Asia is Giovane Elber, who has scored close to 100 goals for Bayern during his six-year stint with them, who will hold special coaching clinics during the camp. The camp involves a four-day football training programme on fitness workshops, footwork techniques and tactical skills by trainers from FC Bayern Munich. They will have an exclusive opportunity to train with Bayern Munich youth coach Maximilian Knauer and GiovaneElber. The Philippine representatives were chosen last May 6 during the National Youth Futsal Cup (NYFC) organized by Allianz PNB Life in cooperation with the Philippine Football Federation (PFF) and the Henry V. Moran Foundation will be sent this August to participate in the AJFC in Bali, Indonesia. Members of the PFF together with former Philippine National Football Team player Danny Moran determined the players based on performance, technique, physique, and decision-making capabilities. The players included FC Malaya's JM Mitra, Tuloy sa Don Bosco's Michael Antillo and Archie Dela Cruz, Iloilo's Konrad Keim Sollurin, and Cordillera Goshen Land's Aeron Christian Tenollar. All five players will train with youth coaches of longtime Bundesliga champion Bayern Munich. Two of them will be chosen to represent the Philippines to the AJFC to be held in Munich, Germany also in August. 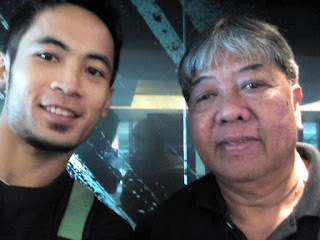 Got a chance to chat with Jessie Landangan who is the coach assigned by the Philippine Football Federation to train the kids before they leave and to accompany them to Bali. He shared his inspiring story and passion for football. Growing up he was once a street kid until the Salesian priests adopted him. It was them who would train and teach him the love for the sport. He would eventually become part of the Philippine national football team. He now pays it forward volunteering as a football coach for street children.